Zombieland 2 is going to be making a bit of a time jump. It was recently announced by writers Rhett Reese and Paul Wernick that the long-awaited sequel is (hopefully) on track to shoot early next year in time for release in October 2019, which would see it released almost exactly a decade after its predecessor. 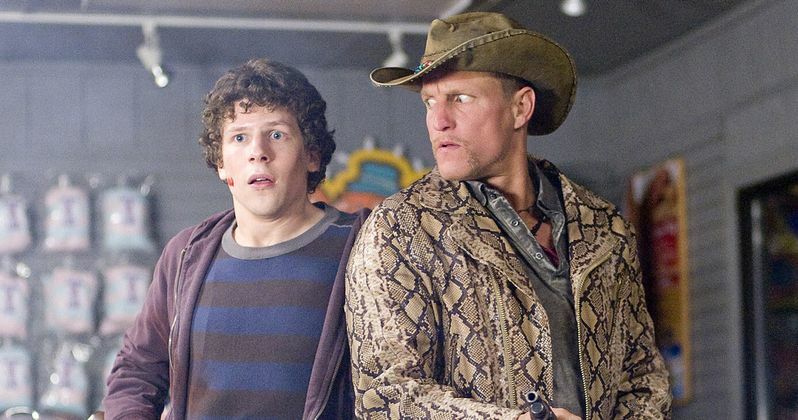 Now, the writing duo has confirmed that Zombieland 2 won't take place right after the events of the first movie. Instead, we're going to move forward by at least a few years. Rhett Reese and Paul Wernick recently did a Reddit AMA in order to promote the release of Deadpool 2. During the course of the AMA, someone asked about Zombieland 2. While they couldn't say too much about it at the present time, they did reveal that the sequel won't be picking up directly after the first movie ended. As they explain, that's more of a practicality, given the fact that the cast members have all aged in the years since. Specifically, Abigail Breslin. Here's what they had to say about it. "Abigail Breslin is 9 years older than she was in [Zombieland], so it won't be happening directly after! Can't say beyond that!" Abigail Breslin was just 12-years-old when the original Zombieland was being filmed. While Woody Harrelson, Emma Stone and Jesse Eisenberg might be able to pull off looking like they did a decade ago, Breslin absolutely can't. So the time jump makes sense. It also might make for a slightly more interesting story. What does the world look like ten years after the zombie apocalypse first started? What has happened to our four heroes in the years since? This may actually make for a better sequel than it might have had it been made in a more timely manner. Sony has had a Zombieland sequel on the burner for some time now, but it hasn't managed to actually materialize into a movie. However, Deadpool went on to become the highest-grossing R-rated movie ever in 2016 and Deadpool 2 is also raking it in at the box office. That means Rhett Reese and Paul Wernick are on something of a hot streak and they may have the juice to get the studio to finally pull the trigger. Not only that, but Emma Stone and JJesse Eisenberg have gone on to become massive stars In their own right in the years since. That means the sequel would have a very attractive ensemble of stars with a couple of writers who know how to craft a hit. Also, the first movie made $102 million at the box office working from a budget of just $23 million, so it would seem there is money to be made with Zombieland 2. Let's just hope Sony actually gets the lead out and makes it happen this time. For more with Rhett Reese and Paul Wernick, you can check out their full AMA over at Reddit.